Wing span: 2 1/2 - 4 inches (6.3 - 10.1 cm). Identification: Large. Upperside of male tan to orange with black scales on forewing veins; female tawny, darker than male. Underside of hindwing with wide pale submarginal band and large silver spots. Life history: Males patrol open areas for females. Eggs are laid in late summer on or near host violets. Newly-hatched caterpillars do not feed, but overwinter until spring, when they eat young violet leaves. Caterpillar hosts: Various violet species (Viola). Adult food: Nectar from many species of flowers including milkweeds, thistles, ironweed, dogbane, mountain laurel, verbena, vetch, bergamot, red clover, joe-pye weed, and purple coneflower. Habitat: Open, moist places including fields, valleys, pastures, right-of-ways, meadows, open woodland, prairies. Range: Alberta east to Nova Scotia, south to central California, New Mexico, central Arkansas, and northern Georgia. 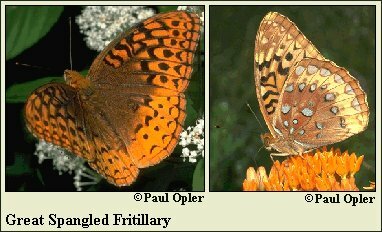 Comments: The most common fritillary throughout most of the eastern United States.